November 11, 2018, Santa Rosa—Santa Rosa Junior College is adjusting its standards of placement for incoming students to make them immediately eligible to enroll in transfer-level math and English courses, in line with the requirements of Assembly Bill 705 (AB 705), which took effect on Jan. 1, 2018. AB 705 requires colleges to maximize the probability that students will enter and complete transfer-level coursework in English and math within a one-year timeframe. It also eliminates placement testing and requires that colleges instead utilize high school coursework, grades and grade point averages to place students into appropriate classes. This bill also prohibits students from being placed into developmental, non-transfer level courses in mathematics or English unless they meet several specific conditions to merit such placement. The legislation was developed in response to nationwide research showing that standardized placement exams are poor predictors of academic performance and that students who begin college in transfer-level coursework, with adequate support systems, outperform those who are placed into remedial course sequences. This change goes into effect at SRJC on January 1, 2019, and will apply to enrollment for Summer/Fall 2019. Based on 2017-18 information, with these changes, it is expected that 2,998 additional SRJC students will be eligible for transfer-level English courses and 4,229 additional students will be eligible for transfer-level math courses. Math, English, English as a second language, and college skills faculty members have redesigned their respective curricula toward streamlined course sequences, support course features, and holistic learning components that are compliant with this new legislation. Faculty members are also engaging in deep professional inquiry, sharing teaching strategies and exploring new classroom approaches geared toward a new anticipated profile of students who will now comprise transfer-level classes. Pre-transfer level English and math courses will remain available within the college schedule of class offerings for students who elect to take them. 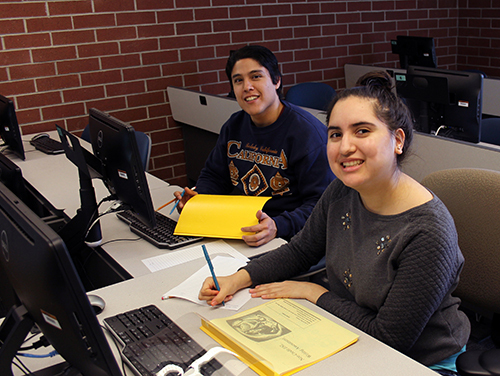 Learning support areas at SRJC are also aligning and leveraging resources in new ways to support students under the AB 705 framework by providing additional in-person and online tutoring resources, support services, and the Peer-Assisted Learning Specialists (PALS) program. For more information on SRJC’s efforts to support students during the transition, please contact Michelle Vidaurri at mvidaurri@santarosa.edu.